I'm sorry I don't have a proper review or a news item what I want to share with our dear and beloved readers but there is something what's on my mind for to share with them all. I finally had the profound life experience of witnessing Gary Clark Jr. in concert in Nashville the other night and it was everything I hoped it would be, something I didn't fully capture in my retelling of the night; it was a wonder beyond words. 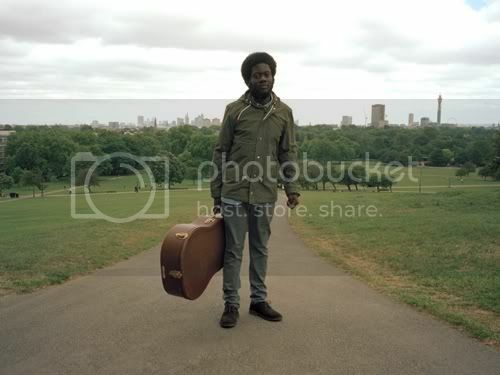 What I also didn't get to tell was the new musical discovery I made that night: a man called Michael Kiwanuka. I didn't know his name before buying the ticket to the show. My impatience with opening acts is legendary with so few of them ever making an impression one could consider in any way positive (The National, Howling Bells come to mind). I was prepared to bathe this unknown artist in the scorn of my indifference and impatience but here's where you learn something: you never know when magic is going to happen- that's why they call it magic. Michael Kiwanuka held me spellbound for his entire hour-long set and I wasn't the only one. The evening was broadcast on a Nashville radio station and was therefore on a tight clock; that didn't stop more than one fellow attendee to call out to him to play longer (and I was shocked to be one of them). I wish you could have heard his achingly beautiful imagining of Jimi Hendrix's "May This Be Love," an underappreciated ballad from his canon. Hendrix recorded it with The Experience, the famed trio of his early records. Kiwanuka and the five musicans backing him -- among them both a drummer and additional percussionist -- took this lovely song to a different place. Kiwanuka's band resembled the ensembles Hendrix played with at the end of his career and as I listened Sunday night, I couldn't help thinking of Jimi looking down from above, smiling, as if to say, "That's exactly what I would have done." I want to listen to Home Again a few more times before I review it but I can't wait until I'm ready and find time to convert embryonic mental scribbles to a proper review to tell you I witnessed magic. I've been touched by the glow of the magic of art and beauty and I can't contain the joy I feel. Two diverse, multi-talented artists shared a stage at a small club in Nashville and I experienced the bliss of art's power to transform and transcend. If you were there, you felt it, too. If not, I'd start streaming the record on Spotify immediately (the CD will be available domestically July 17 and the album has been pressed on vinyl for my audiofile friends). You won't be sorry and you needn't thank me- just do as I've done and share it with someone else.